To date, Blank and Sons offers four flavors, "Our First", "Texas Spirit", "Texas Heat", and "Black Peppered". 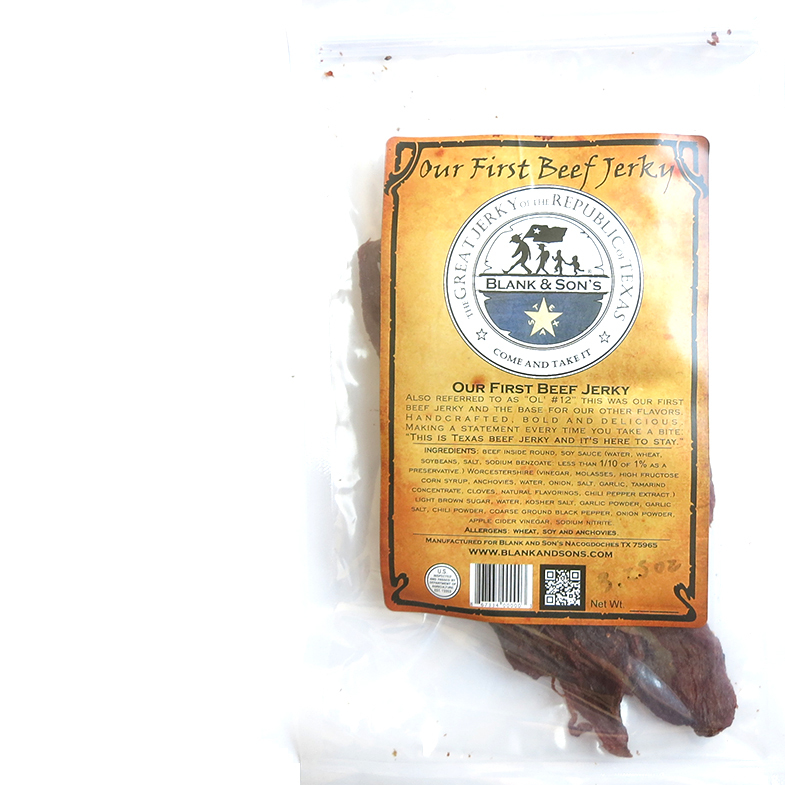 Their jerky is available in a handful of stores throughout the greater Nacogdoches area, and from their website as well. Beef inside round, soy sauce, worcestershire, light brown sugar, water, kosher salt, garlic powder, garlic salt, chili powder, coarse ground black pepper, onion powder, apple cider vinegar, sodium nitrite. The first flavors that I pick up on the tongue is a garlic seasoning salt, and a savory, sauce flavor. The chewing brings on more of the garlic, but also a lighter onion, and a touch of sweet. There's also a smoky character, though the company has made no mention of this jerky being smoked. Considering this is company's "Original" flavor offering, it's still very flavorful, though not at all spicy. The black pepper is subtle, though the saltiness feels significant. Instead, much of the flavor comes from the garlic powder, garlic salt, and onion powder. But yet it also draws flavor from the soy sauce and worcestershire combo. There's not much natural meat flavor that comes out of this, perhaps due to the stronger garlic and salt profile. Verdict: "Our First Beef Jerky" from Blank and Sons is quite tasty, mostly from the stronger garlic and lighter onion flavoring. For something that's sold as their "regular" or "original" jerky, it's still a bold flavor, yet not spicy at all. 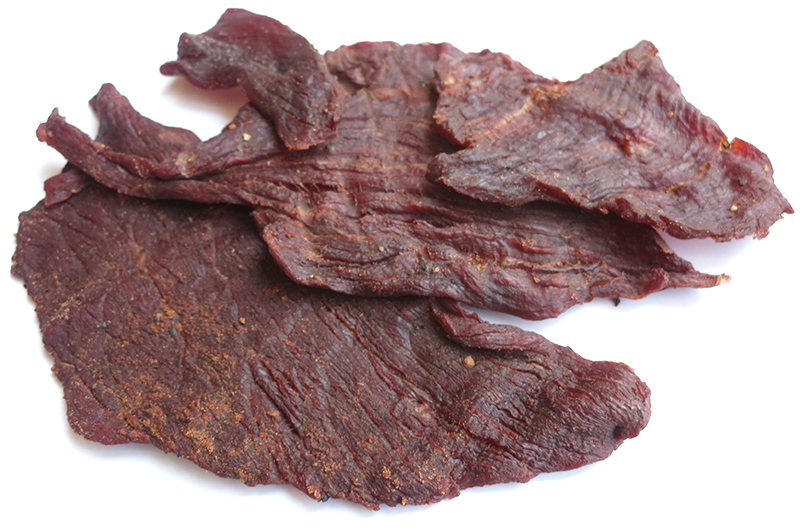 It's a very "manly" jerky, aggressive in flavor, meaty in chewing, with a strong smoky, garlic, aroma. Just taking a smell from the bag will open your eyes and say, "Oh wow!". The stronger saltiness will make you want to keep a cold beer nearby, however. Overall, I really enjoyed this jerky, but I think the stronger saltiness eventually overtook my palate. 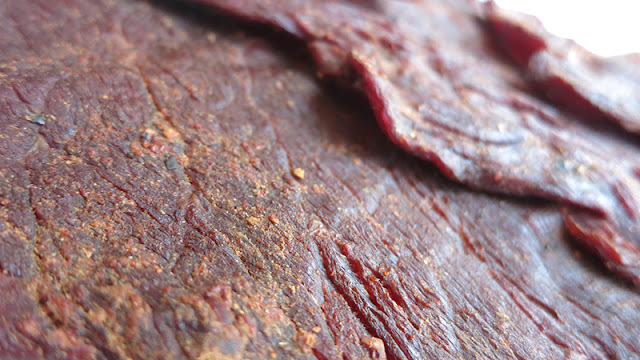 It's a great jerky to cut up into smaller strips and share with friends over a patio table and cold beer.